Corruption has a face: Between Waziri, the EFCC, Kenny Martins and Hilary Clintons revelation. So many persons in government, politicians, activists and journalists as well has interpreted Mrs. Clinton's message as either the bitter truth, outright rubbish or, as the case maybe, a ranting of a government that is somehow showcasing the theatrics of a 'holier than thou' attitude. One of such comments on the issue which I find somewhat hypocritical as well as deceptive, if I should be critical in my analysis, is attributed by the Sunday Editor of the Sun Newspaper of August 16, 2009, Vol. 5 No 334 by Funke Egbemode. In her column entitled, “And what exactly does Mrs. Clinton want?” the Editor begged to disagree with in more ways than one,” that the anti-graft Agency, the Economic and Financial Crime Committee (EFCC) has fallen offer over the past two years, as delivered by the New York democrat that contested quite keenly with the present President of the United States, President Barrack Obama. I am exactly marvelled at the clean bill of health handed down by the editor, who if my memories serves me right, was at a time, an aide to the former first lady speaker of the House of Representatives, Hon. Patricia Etteh. For the benefit of those who might be suffering from the syndrome of forgetting events so soon, a disease that is one of the bane's of this country, Etteh was sent parking from her hallowed office over discrepancies in her attempt to refurbish her official apartment with over N600m. That is certainly no news again in Nigeria and the matter has since been swept under the carpet which holds various corrupt cases that needs immediate and radical actions should our dear country be great again. Before I digress to other issues, I would certainly, in the most critical way, present what I call the anatomy of corruption and misrule of law that has become the second nature of both the present government of Nigeria and the supposed almighty United States of America which prides itself as being the epitome of good governance. Egbemode in her piece, tried to unsuccessfully paint the former EFCC helmsman, Mallam Nuhu Ribadu as someone who acted first and read the law later and heralded the present EFCC boss, Madam Farida Waziri as a lawyer and seasoned cop of international repute. She did not stop there. “As at today she has secured 65 convictions in 12 months which represent about a third of all convictions secured since the establishment of the commission in 2003. She has also made recoveries of over N50bn in the last 12 months,” she informed. This is stale news considering the statistics in a release by the EFCC to media houses. I will not bother to authenticate these claims by taking a cursory look at the acclaimed convictions and 'enormous fund' recovered. I will like to deal on one or two persons referred to as being convicted by the anti-graft agency. Egbemode mentioned, Boni Haruna, Rasheed Ladoja, Bode George, Prince Ibrahim Dumuje, Roland Iyayi, and so on as making up the list of the 65 convictions the EFCC has recorded. Interestingly, the columnist failed to inform her readers that most of the names she penciled are walking around and going about their business as free men; that is misinformation. Even the former governors on the list, as we all know, are EFCC customers facing prosecutions. They are free men on bail ridiculing our judiciary system. A former Edo State Governor for instance, was given a soft landing despite his crimes, to pay N2m as fine for embezzling over N5b; that is the kind of convictions we have witnessed over the past 12 months under Egbemode's famed Waziri. However, Prince Ibrahim Dumuje though mentioned, was not a governor is connected with the infamous Police Equipment Fund (PEF) manned by Kenny Martins who outwitted all the law enforcement agents in the country with technical abracadabra that included taking refuge in a court. Kenny Martins and his PEF robbed Nigerians and the international community of millions of dollars and these incriminating act was exposed by the human rights lawyer, Festus Keyamo and the then EFCC led Nuhu Ribadu, alerting the world of the fraud. Kenny Martins and Dumuje have been entertaining Nigerians and exhibiting how our judicial system can be manipulated. EFCC declared Dumuje wanted for fraud and conspiracy in the third degree and he is still wanted by the Kirtland Police in the US where it was discovered that a Mr. Joe Hill had been wiring money fraudulently to Ibrahim Dumuje whose date of birth is 3rd March 1956 as indicated on Dumuje's international passport number A1049251. Police investigations revealed that Dumuje got at least $398,195 wired to him in 235 installments. But the Farida Waziri's EFCC is blind to this fact. This charade smells of a government that is irresponsible and an incompetent judicial system that is handicapped. The government is not serious about tackling corruption and entrenching the “rule of law,” an anthem covering the nefarious acts of PEF actors. The question is, who is the unseen hand manipulating the system? Is it the hand of Farida Waziri, the famed cop, or Hilary Clinton, whose homeland security agencies have disregarded a court warrant hanging on Dumuje's head. Where is the INTERPOL? The results can be seen from the directives of a United Kingdom court that a Nigerian High Court judge should sign an agreement on the extradition process of one of Ibori's accomplices in the massive looting of the Delta State treasury, a document signed by the Attorney General of the Federation, Mike Aondoakaa who the UK court passed a vote of no confidence to his maverick alliances towards ex-governors who are on trial in the UK. In retrospect, the PEF affair, for those afflicted with amnesia, should recall that the PEF was conceived with a sincerity of purpose and a vision to consolidate and empower the Nigeria Police Force. Three Nigerians conceived the idea, and before gestation, one of the visionaries was edged out under very bizarre circumstances which became the Achilles heel of Kenny Martins and Dumuje. Within a few months, N7.7 billion was deceptively withdrawn from all the 774 local governments' councils in the country; millions of dollars were gotten from the international community financial institutions invested in the project. Many heralded the dawn of a new and equipped Police Force. Nigerians felt that at last, trust police to serve them better but none of the objectives of the basic principles that established the fund was fulfilled. Instead, Kenny Martins, who hitherto was living like an ordinary citizen, was suddenly swimming in affluence. He became a Father Christmas of sort and started doling out cash like has never been witnessed before. He sponsored a boxing bout, spent millions during his son's wedding and was alleged to have acquired a vessel. Suddenly, cars bought in the name of the Nigeria Police Force were distributed amongst his friends and other security agencies to indirectly secure an insurance against prosecution lest the files were opened. In all these brazen display of ill gotten wealth and frantic mismanagement and misappropriation of state funds, Nigerians were alerted, the police were aware EFCC was petitioned and the presidency notified both the upper and lower houses were in the know of the corrupt practices being perpetrated by Kenny Martins and his lieutenants but nothing happened. The media investigated and reported the fraud and it took a while for the wool to be pulled off the eyes of the police. A helicopter was paraded at Louis Edet house as part of the so-called largess of the PEF to the police but after the show, it was never seen. Only then did the law enforcers act. The drama changed venue and act two of the unfolding theatrics continued in the courts. The court and lawyers who appeared too involved them should be started the antics best known to them. Investigations of the cases which should have provided enough evidence for prosecution became wanting. The drama has since been on and Funke claims the EFCC Waziri has secured 67 convictions. Can these convictions please be published on the pages of Newspapers than being mentioned in secluded press releases? Kenny Martins has been blabbing about accusing the EFCC of inability to prosecute him and neither the police nor the EFCC under Waziri has proven him wrong. At a time, the Cop of unblemished record, according to Funke, announced that beneficiaries of the car gift splash from Martins should return such gifts but it is more than a year since that order was given. Can Farida let Nigerians know how many of those Greek gifts have been returned to the EFCC? It has not bothered Farida to get the customs, another government agency that stinks of corruption, to show how the waiver gotten over the cars were utilized; information that would help her in prosecution. The ALGON which were robbed of N10m each have not been contacted by the EFCC under Farida to explain under which circumstances a criminal withdrawal was made from their respective allocations yet, Funke is of the opinion that the EFCC has not fallen. As if the PEF scam was not enough, at least, Kenny Martins who discovered he was somehow above the law, went on to take his notorious trade outside the shores of the country. Recently, even while still facing charges of corruption, mismanagement of funds of the PEF, Kenny Martins, using the PEF which still bears the name 'Police' to defraud a company, Calvary Group of $400, 000. He was said to have illegally represented the Federal Government to defraud the American company the huge sum, an act punishable under section one (sub-section 3 and 10) of the Advance Free Fraud Act 2004. He was also alleged to have entered into series of agreement under false pretence for the right of benefit from accessing a loan of $97.5 million from Exim Bank. Martins was also alleged to have illegally presented himself as an official of Nigerian Government for the procurement of $97,800 from Exim Bank. These crimes, according to the charge sheet, were allegedly perpetrated by Martins between 2007 and 2008. The Federal Government was forced to embarrassingly send their defense team to tell the court and the US Bank that the loan being sought was not from the FG. 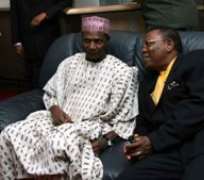 With all these crimes committed so brazenly by Martins without the supposed long hands of the law catching up with him, how does President Umaru Yar'Adua expect to be invited to G8 Meetings of countries? The House of Representatives Committee on Public Investigations investigated the activities involving the PEF and found that the monies collected from ALGON were obtained fraudulently and made a number of recommendations which included that the PEF should stop using the name Police to publicly solicit for funds and the name should be withdrawn with immediate effect; that the FG should freeze the accounts of the Presidential committee on the PEF; that a copy of the findings should be sent to the EFCC for further actions but the Demeji Bankole and the House of Representatives have failed to adopt the findings till date making millions of Nigerians keep wondering if the Demeji Bankole led House is assisting in upholding the rule of law. Instead, what Nigerians have been witnessing is a slow motion justice system where the alleged criminals are granted bail to go and receive medical treatment abroad and while the Waziri-led EFCC is barking and not biting hard as was the case when Nuhu Ribadu was there. The recent shake up in the banking sector has all of a sudden brought the EFCC to limelight again with the arraignment of the sacked bank chiefs. Waziri may have gotten a life line but then, the whole exercise smells of suspicion as nothing has been heard of some of the companies allegedly belonging to James Ibori that is owing billions of Naira to these banks. Another episode of comedy has been unleashed on Nigerians but what we ask is what is happening to the many cases involving the ex-governors, Kenny Martins and the PEF fraud of which Farida Waziri has swept under the carpet. The Law is supposed to be no respecter of persons but it seems we still have highly placed sacred cows walking about and boasting of their connections in high places. In all these, corruption has a face; we see them everyday in our television, on the pages of newspapers and hear their voices on the radio Their houses are in the choice areas in Maitama or Ikoyi and they are still the same people that have crippled our financial institutions. What worries me is that in all these embezzlement, fraud and mismanagement of public funds, we have never seen one of the faces of corruption convicted like we saw when a former Inspector-General of police was jailed yet Waziri and the EFCC is blind to all that we see and hear. Maybe Funke can better explain. Let them that are evil know this, the evil that men do will certainly live after them and their generations to come.